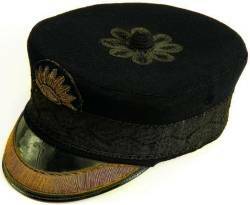 Innovative design and aesthetically stunning.....a true style icon! 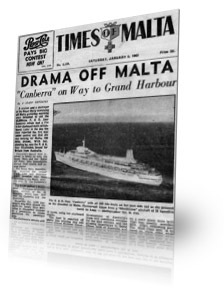 Shortly before 17:00 hrs, on 2nd June 1961, Canberra set sail from Southampton on her maiden voyage, amidst a blaze of publicity, and with 2,238 passengers embarked. 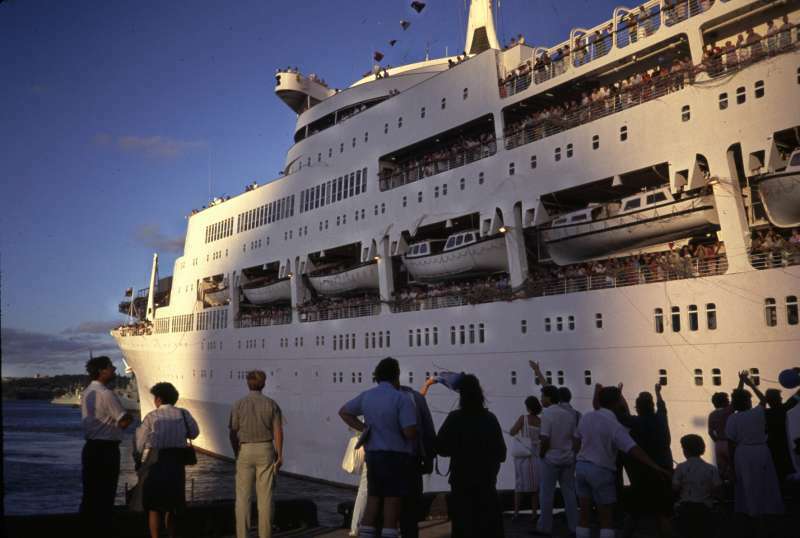 She was fully booked, despite her scheduled departure being 'out of season', at a time when the majority of P&O passenger ships were UK-based for summer cruising. 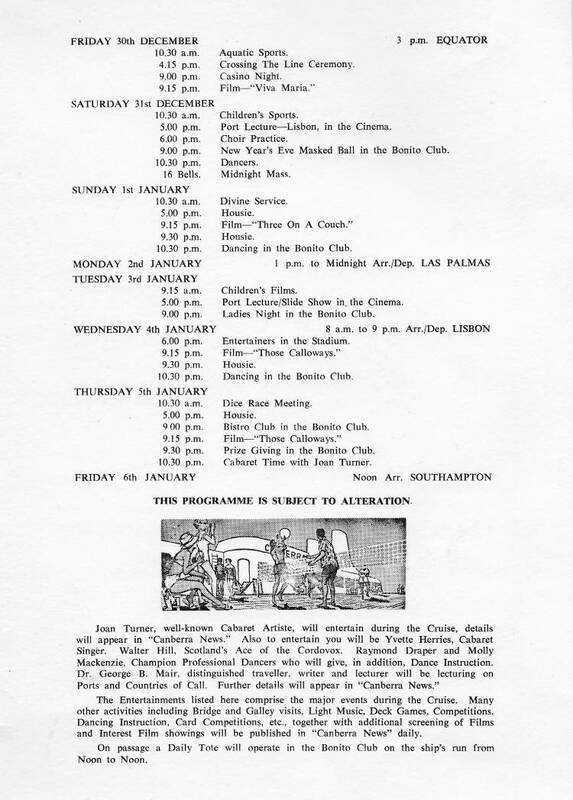 There had been a clamour for tickets right across the UK and Europe. 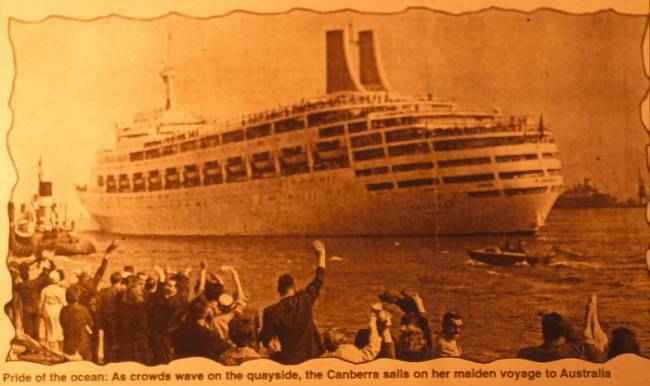 A maiden voyage aboard a passenger liner as exciting as Canberra was not something that happened every day. Some of her passengers had booked to travel only as far as Gibraltar or Naples, but there were also 750 emigrants on board - setting off to start a new life in Australia, together with another 120, who were bound for New Zealand. You look magnificent, and all in Strathaird wish you a happy and successful voyage, and from old to new, Strathaird bids you farewell. You too look magnificent with your paying off pennant flying gaily. You look a gracious and not too elderly lady. All well here. Down below in the engine room, however, all was not well: there was a problem with one of the condensers. Saline had been found its way into the distilled water - most probably caused by leaky tubing. The problem caused the ship to miss her first southbound Suez convoy. A further 14-hour delay was incurred at Aden, where Canberra suffered a complete power failure. Sweltering in the heat without air conditioning, her passengers were informed that they could take their bedding up on deck for the night - if they so wished. She arrived at her next port of call, Colombo, 12 hours behind schedule, and after departure, speed had to be reduced again as the condenser problem reared its ugly head once more. Canberra was thirty-one hours behind schedule when she arrived at Fremantle. 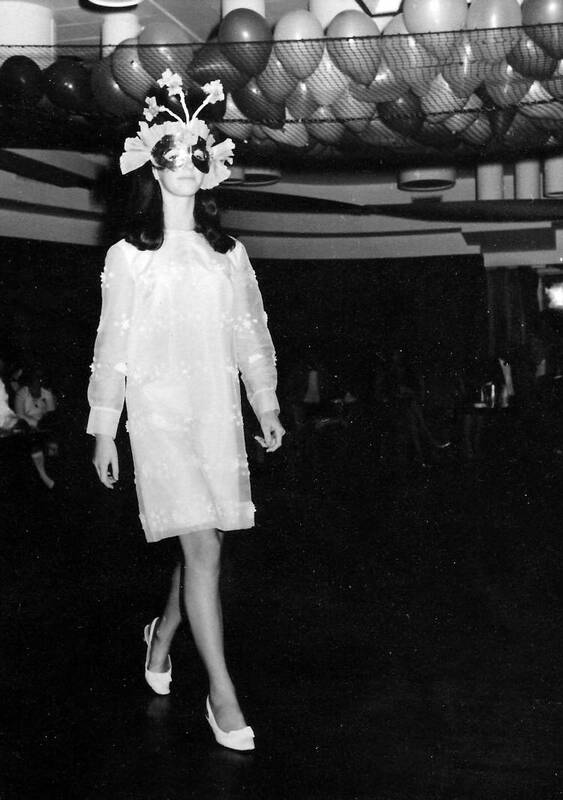 But nobody who awaited her arrival with great excitement and anticipation, seemed at all perturbed by the delay. 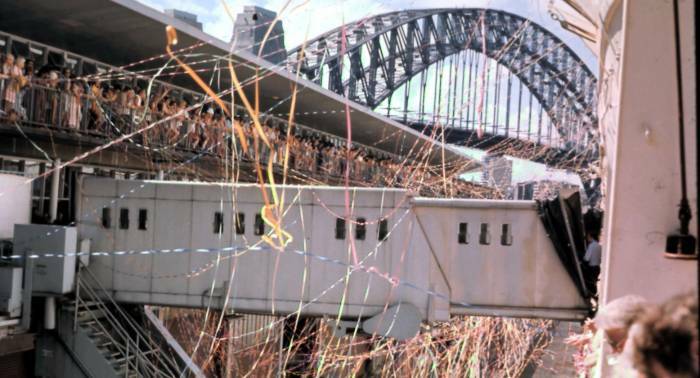 There was a holiday atmosphere - crowds cheered and car horns sounded as thousands flocked to the shoreline to get a glimpse of P&O's exciting new 'ship of the future'. A tangible link with the 'old country'. Between Fremantle and Adelaide, speed was again reduced due to continuing problems with the port condenser. Waiting for the ship on the quayside at Melbourne was Canberra's sponsor - Dame Pattie Menzies, who travelled on board, to the next port of call,; Sydney. Hundreds of small boats escorted her in from the Heads and thousands of well-wishers crowded the shorelines. The welcome she received, despite being around 24 hours behind schedule, was inspiring - an unforgettable experience for all on board. 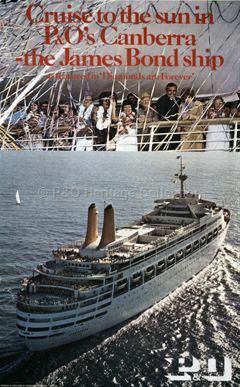 Safely alongside, P&O's Chairman, Sir Donald Anderson, gave a press conference, explaining that the well-publicised condenser problem that had plagued the ship, since Naples, had been rectified. 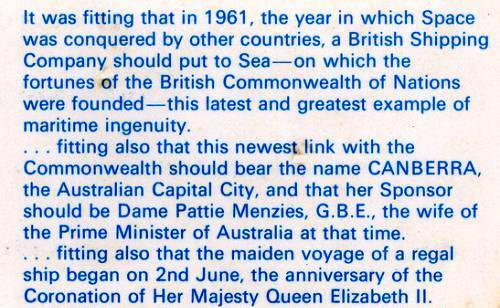 Wherever she went, Canberra attracted huge crowds of onlookers, and in Auckland, the 12th July was declared 'Canberra Day' in her honour. The maiden voyage continued well, with all manner of spectacular arrivals and tributes to the ship. It was not without incident; however, as berthing in Auckland was delayed for a number of hours due to heavy fog, the worst for almost 30 years. 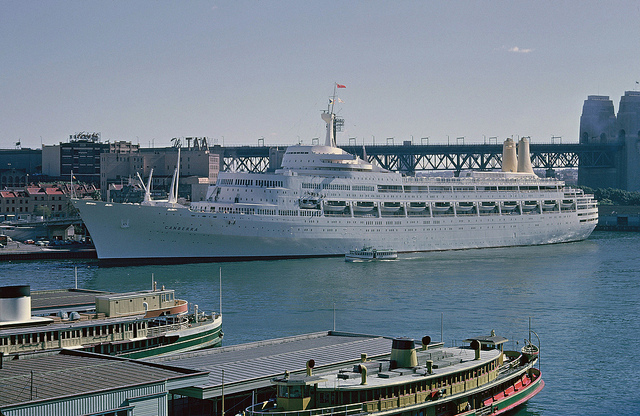 Wednesday, the 12th of July was declared as Canberra Day in Honolulu, and hundreds of small boats sailed out to greet her at Vancouver. At San Francisco, Canberra was given a 13-gun salute from Telegraph Hill as she made her way to pier 32. Canberra berthed at the Matson Line Pier, San Francisco, with Arcadia making her departure. 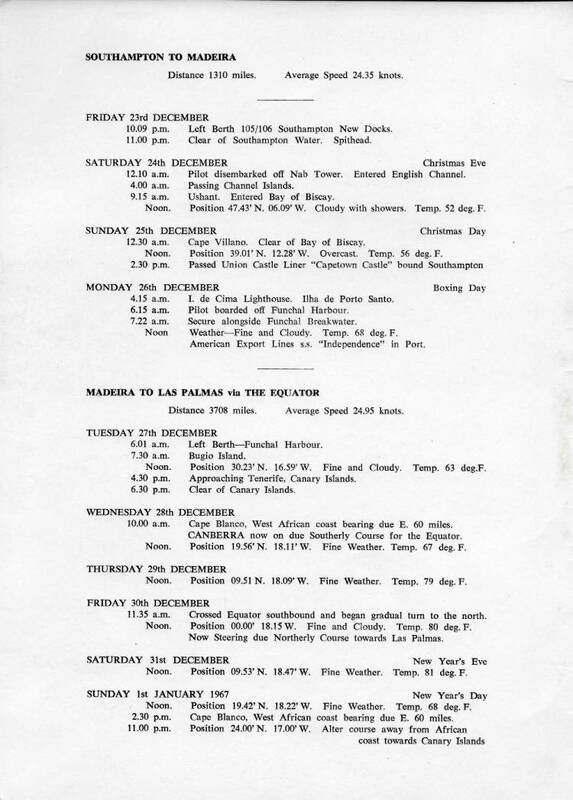 Continuing down the US West Coast to Los Angeles, she was given a 50-gun salute and a display of world champion water-skiers was laid on in her honour Then it was back to Southampton via Honolulu, Wellington - where force 12 winds delayed her arrival - then Sydney, Colombo, Aden and the Suez Canal, Naples, and finally, Gibraltar. She arrived back in Southampton at 10:45 on Monday, 4th September 1961, having cut the passage time from Sydney by a week. She had carried 11,000 passengers and steamed 42,000 miles, and despite the troubles with the condenser, the voyage had been hailed a complete success. And her condenser malfunctions - just an irritating teething problem. 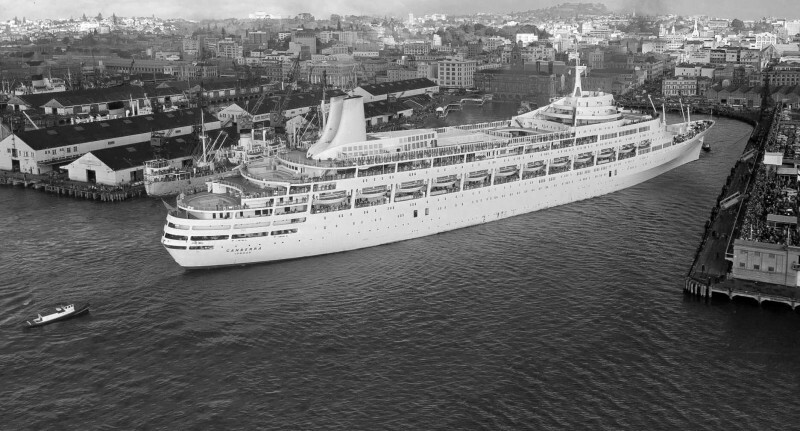 Canberra off Gibraltar, maiden voyage June 1961. 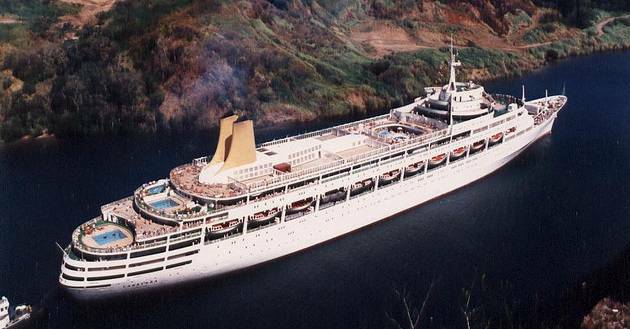 During her maiden voyage, she steamed some 42,000 miles and carried 11,000 passengers. Canberra's second voyage was scheduled to commence at 1330 on Friday 22nd September 1961, but a minor engine room fire delayed her departure from Southampton by five hours. After a short call at Gibraltar she continued across the Mediterranean to Naples, then to the Suez Canal and onto Aden. Between Aden and Colombo, a blade in one of the main turbo-generators broke, forcing the ship to reduce speed by five-knots, in Sydney on October 18 and repairs were made. Sydney departure with the Opera House under construction. The teething problems and misfortunes persisted during Canberra's second voyage, with a small fire and a broken turbo-generator blade delayed her again. 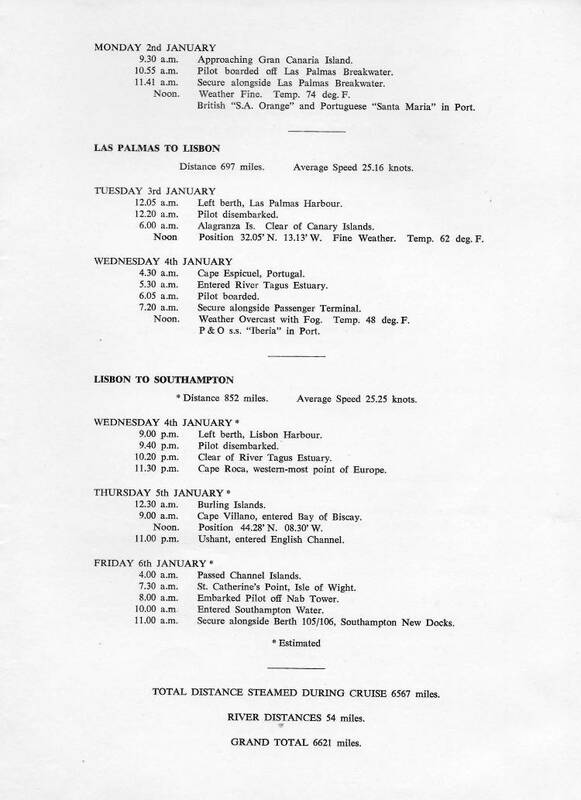 Her third voyage was uneventful, but the fourth was cut short and her schedule altered to take her home via the Panama Canal - which cost P&O £11,000 in canal fees. 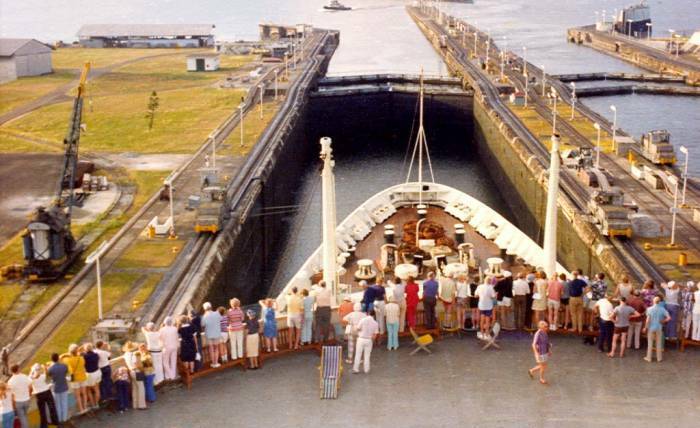 At the time, she was the largest ship to transit the canal, with a clearance of only 3'6" in the Gatun Locks. Canberra in the Gatun Locks - nearly 2 miles in length. 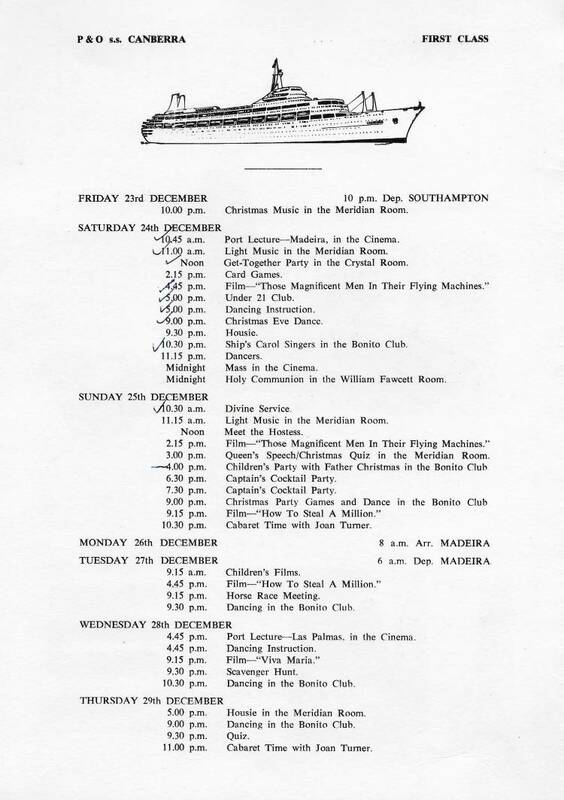 Arriving back in Southampton on June 21st 1962 for a 29-day overhaul to sort out her recurring problems, it was decided to make a few modifications to the ship's appearance as well. The first class stadium - the sheltered games area on Games Deck between the Bonito Club and the Crow's Nest - had not proved popular. The retractable deckhead was welded closed and the area below was turned into a theatre. Air conditioning units were later added, but were never really up to the job. Two five foot extensions were added to the funnels to stop the black staining around the funnel tops, which dramatically improved their look. On 4th January 1963, Canberra was steaming eastwards across the Mediterranean, at 27 knots and with 2,222 passengers on board. At around 04:00 hrs, about 160 miles north-east of Malta, one of her three turbo-generators shed its load, and began to motor, faster and faster. The engine room staff were unable to trip the circuit breaker. 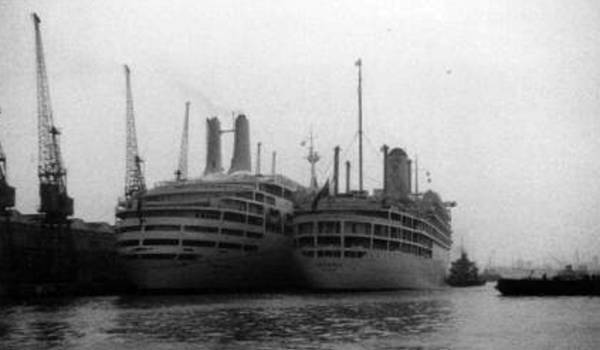 Then one of them forcibly broke the contact - despite a sign warning against this - creating an electrical arc which caused a fire that continued to be fed electrically by the other two generators, thus destroying the starboard side of the switchboard and many electrical distribution cables - causing the ship to lose all power. Alarms were sounded throughout the ship. With no electrical power, she slowed and stopped dead in the water. She was without lighting, ventilation or power for the galley. Alarmingly, sections of her lower decks had begun to fill with smoke and passengers were ordered to their muster stations. Lifeboats were made ready. Without power, the public address system, which would normally have been run by the emergency generator, failed. Fortunately, the ship's Radio Officers rigged up a battery powered jury system, and broadcasts were resumed to both passengers and crew. 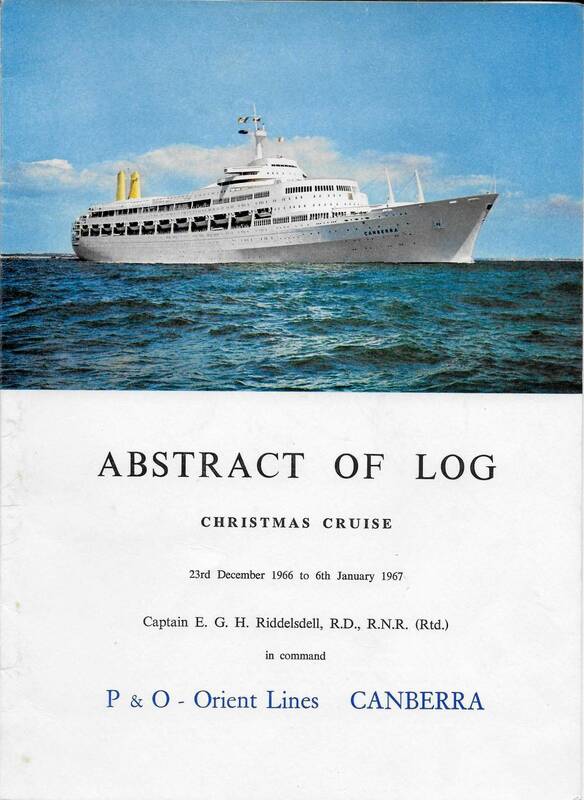 The venerable old Stratheden, on passage from Port Said, was diverted to assist Canberra. 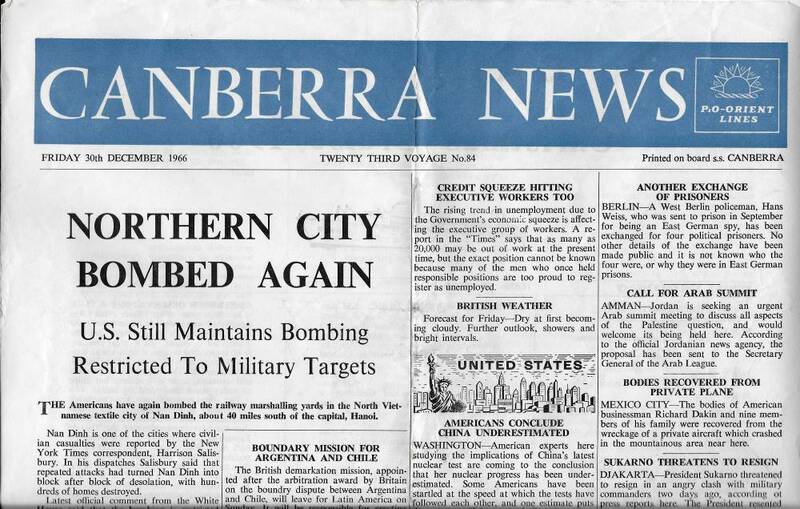 Her bakers worked round the clock, producing loaves of bread for the beleaguered Canberra's passengers. Meanwhile, on board Canberra, the ship's crew were preparing a tow line, the 'insurance wire', which was stowed at the bottom of number one hold, underneath tonnes of passenger baggage. Back on board Stratheden, her crew were shoring up the after deck house, which served as her isolation hospital, in readiness to loop the towing bridle securely around it. P&O ships were not designed to tow each other, but in extremis, it could be done! Two Royal Navy ships - the cruiser HMS Lion and the destroyer HMS Scorpion - were exercising in the area and headed towards the stricken ship, while an RAF Shackleton AEW aircraft based in Malta, was despatched to overfly the area. As dawn broke, the ship's engineers and electricians had managed to restore power to the main engines, and Canberra got underway. Slowly, she headed for Grand Harbour, Malta where repairs would be carried out. With her speed gradually increasing to ten knots, she safely made Malta by 09:00 the next morning. Meanwhile, in London, emergency plans swung into operation. 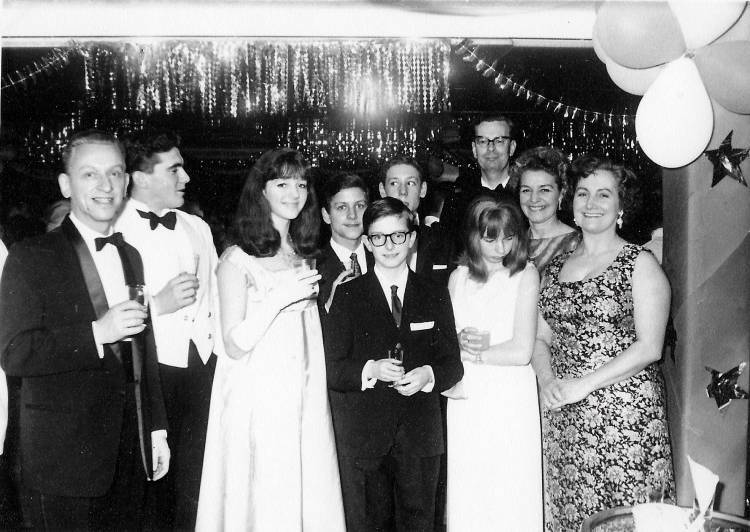 Freddie Laker, the boss of Laker Airways, masterminded the 'Malta Airlift' as the press called it, and within a week, 14 large aircraft had been chartered and P&O managed to fly 1,700 passengers to their destinations. 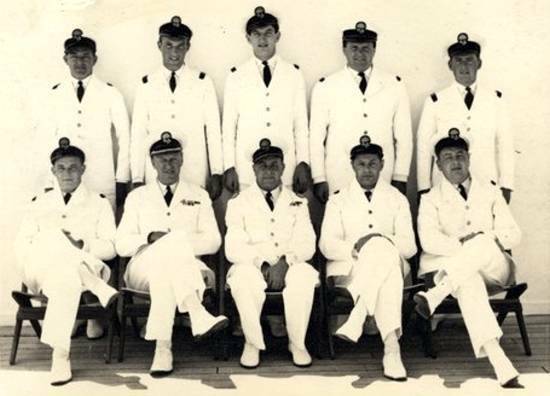 Mainly Australians and New Zealanders, some passengers refused to fly, opting to remain on board Canberra, or taking passage in other ships. On 14th January, Canberra departed Bighi Bay, Malta, with under 50 passengers on board, and headed for Belfast, where she had been built, arriving on January 21st. The lingering smell of smoke was everywhere, and all the soft furnishings had to be removed for dry cleaning or were destroyed. She was out of service for four months, during which time Harland & Wolff fitted a new switchboard, and gave her a general overhaul. On 11th May she underwent sea trials in the Irish Sea, anchoring off the Isle of Wight on the 14th, and entering No.7 dry dock in Southampton the next morning for a routine hull inspection. On Friday 24th May, Canberra sailed from Southampton once again - with a record 2,266 passengers on board. On 16th May 1966, the National Union of Seamen launched its first national strike since 1911. The aim of the strke was to secure higher wages and to reduce the working week from 56 to 40 hours. It was widely supported by union members and caused great disruption to shipping, especially in London, Liverpool and Southampton. 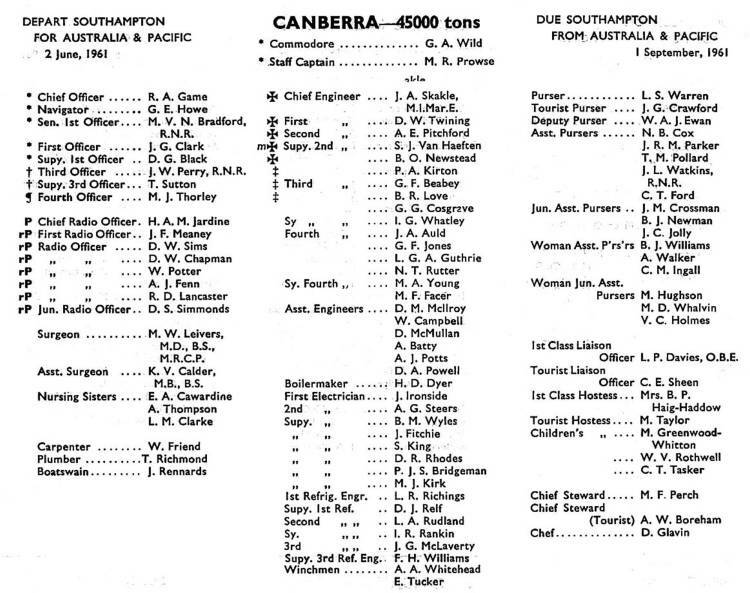 Canberra and Arcadia were caught up in the strike, along with dozens of ships in the Southampton Docks. 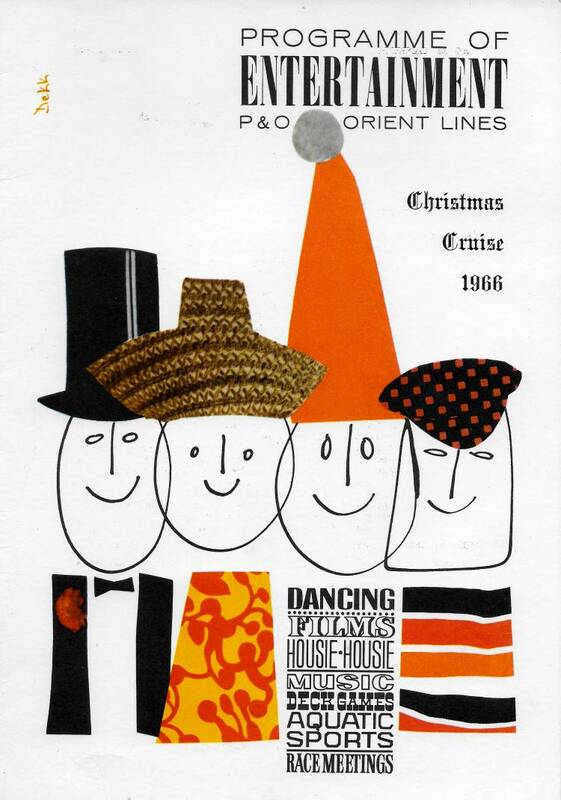 "P&O made a profit of $23 million pounds in 1965 and all I ended up getting from this strike was an extra 5 shilling a week!" 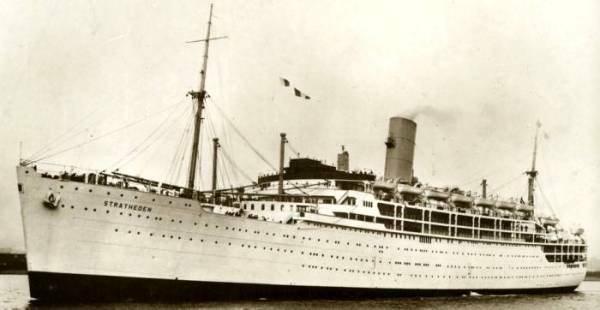 Laurie Lesley, Steward ss Arcadia. 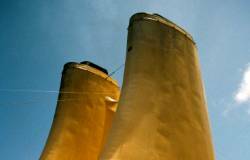 P&O was forced to cancel three of Canberra’s cruises. 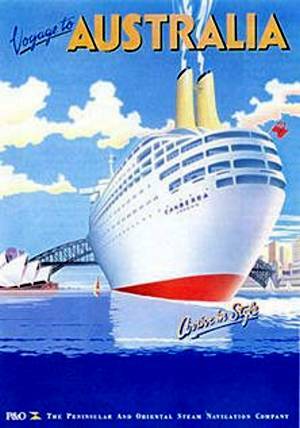 Canberra was commissioned to operate the combined P&O-Orient Line service between the United Kingdom and Australia. The arrival of the jet airliner had already caused a drop in demand for this service; a reduction in emigration to Australia - and wars, forcing the closure of the Suez Canal, had seen the route become unprofitable. 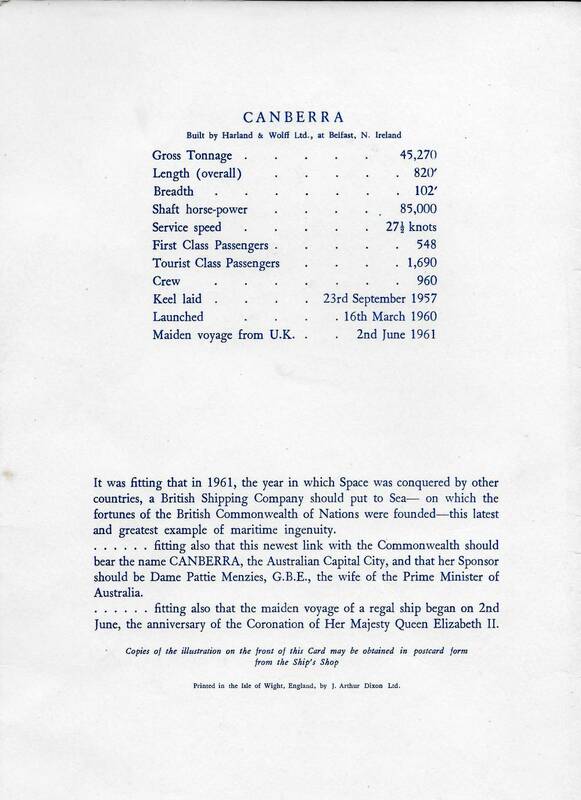 However, over the next few years, Canberra’s career was generally considered to be reasonably successful, but by the end of the decade soaring fuel costs and the first passenger flight of a Boeing 747 across the Atlantic had begun to signal the end of the age of the liners as pure transports, so after an unsuccessful season as a cruise ship operating out of New York, mainly to the Caribbean. After only two cruises, she spent three weeks laid up at the mouth of the Cape Fear River, before returning to New York, from where she completed a further nine cruises. 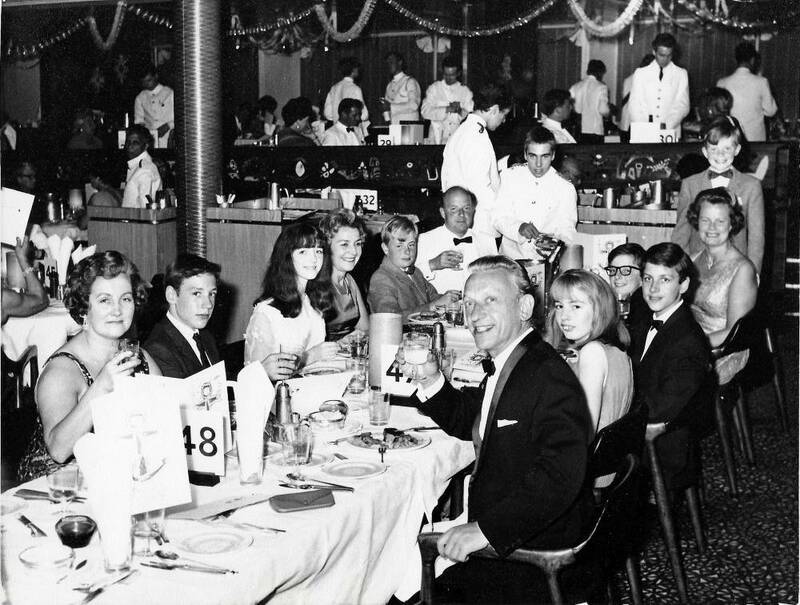 Joan Turner, a British comedian and singer was a popular entertainer on board Canberra. 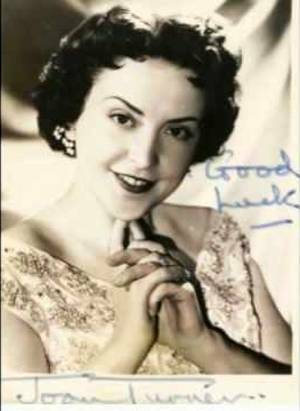 Born in Belfast and brought up in London, she appeared on stage and TV and had her own radio show, becoming the highest-earning female singer in Britain. She could sing a pop or operatic song with her four-and-a-half-octave soprano voice, do an almost eerily convincing impersonation of Bette Davis, and then switch to a stand-up comic routine. Family group at dinner in the First Class restaurant. 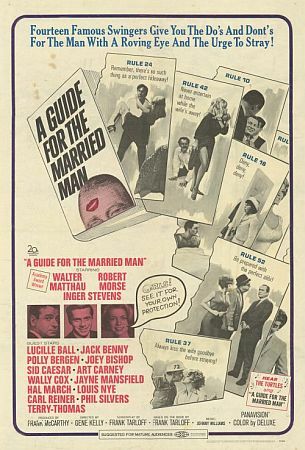 Upon completion of A Guide for the Married Man, a bedroom farce filmed in 1967, starring Walter Matthau and Inger Stevens, the production company held a special movie preview aboard Canberra, en route from Vancouver to San Francisco. Unfortunately, while the short voyage was a success - the movie was a flop! James Bond: I’ll be the judge of that… that’s rather potent. Not the cork, your after-shave. Strong enough to bury anything… but the wine is rather excellent. Although, for such a grand meal, I had rather expected a claret. Mr. Wint: Of course. Unfortunately, our cellars are rather poorly stocked with clarets. James Bond: Mouton Rothschild is a claret. And I’ve smelled that aftershave before, and both times I’ve smelled a rat! 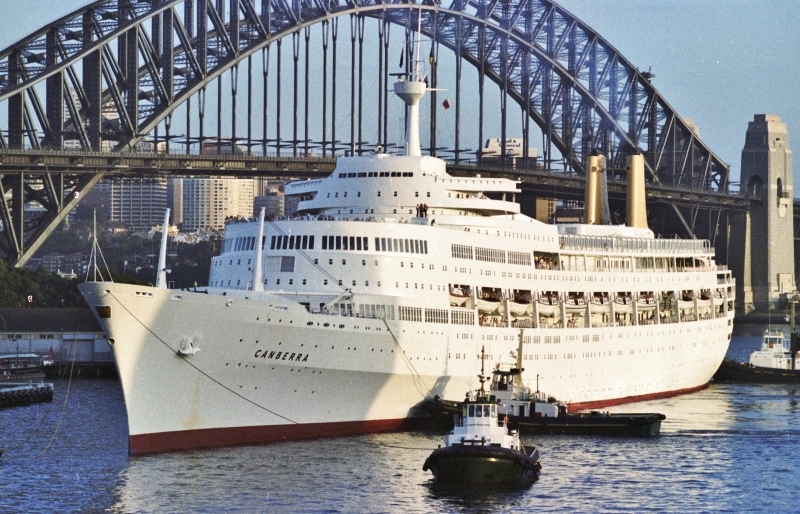 P&O's senior management said she was unsuitable for world-wide cruising, and the Company's Richard Adams stated at a press conference that Canberra had lost the Company half a million pounds between February and September 1972. He went on to explain that she was worth over £600,000 if sold for scrap, or even more if she was sold as a going concern. Her draft posed a problem for voyage planners. If it could be reduced to under 32 feet, it would put many more cruise destinations within reach. Notwithstanding the sudden oil price hike of October 1973, when OPEC inflicted an oil embargo against nations perceived as supporting Israel during the Yom Kippur War, which resulted in oil trading at US$5.11 a barrel - an increase of 70% - refitting her with diesel engines had been considered viable if they could achieve it for under £3 million. Canberra burned 250 - 300 tonnes/day at sea. 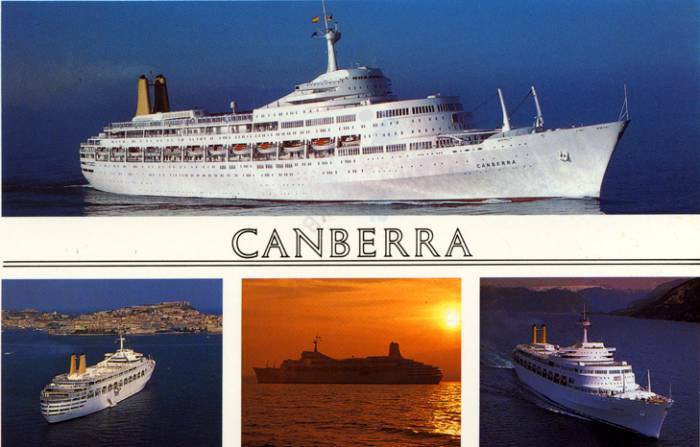 All the options were considered, at some length - then, completely out of the blue - the worldwide cruise market suddenly improved - dramatically, and it was decided that Canberra would take the place of Orsova, for her 1974 cruising programme. 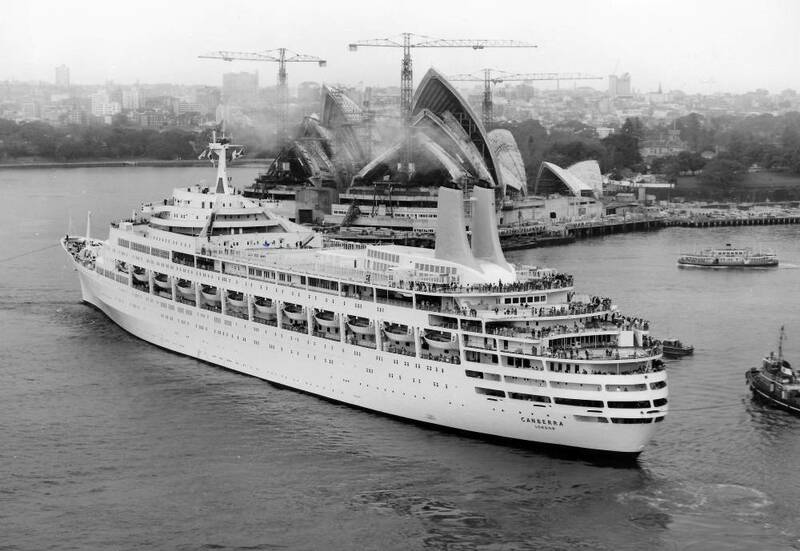 Canberra sailed back to England for a refit as a ‘one-class’ cruise ship, with short cruises out of Southampton for most of the year and from Sydney in the autumn. 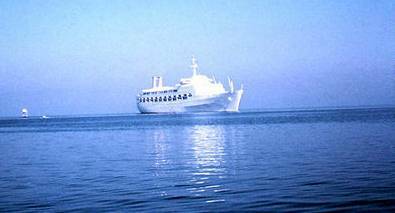 'Theme’ cruises were introduced to great acclaim - profits soared and everyone was happy. 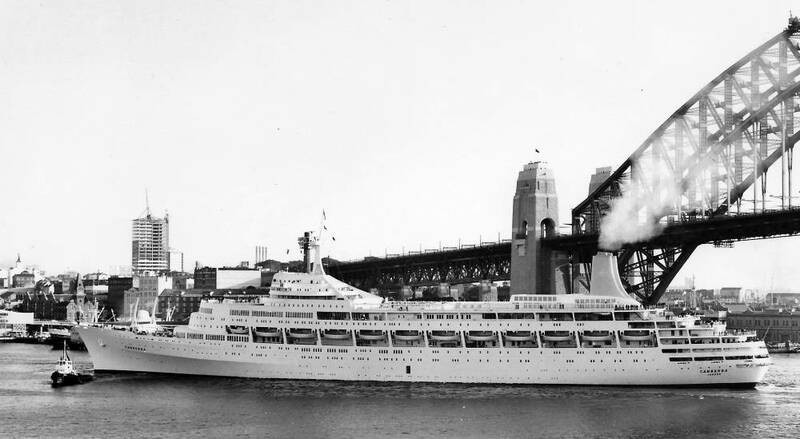 Unusually, Canberra's transition from an early life as a purpose built ocean liner to a long and successful career in cruising, occurred without massive expenditure, and with few external alterations, and with only the minimum of internal and mechanical changes over the next twenty-three years.